Home » Dental Implants • Periodontology • Prosthodontics » What are Dental Implants? Definition of Dental Implant: A prosthetic device or alloplastic material implanted into the oral tissue beneath the mucosal and/or periosteal layer and on/or within the bone to provide retention and support for a fixed or removable prosthesis. Dental implants are prosthetic devices used in dentistry to support the restorations. These are made of biocompatible materials like titanium and may resemble a group of teeth or a single tooth to replace missing sets of teeth. In simple terms, dental implants are artificial teeth that are placed to restore the dentition of a person. They perform much like real teeth. Dental implants may be used as a better alternative than bridges and ill-fitting dentures. Dental implants tend to be more permanent and they look like original teeth in place without the fear of losing or falling just like dentures. All dental implants placed during this time are root-from endosseous implants. In this line, they appear as an actual tooth. They are implanted in the jaw bone and the bone of the jaw osseointegrates with the titanium post. This process of osseointegration involves the fusion of the implant with the surrounding bone making it appear like real teeth. However, dental implants lack periodontal ligaments that hold the teeth in place like real teeth. Because of this, individuals with dental implants may feel a little different sensation while chewing. Before the advent of these root-form endosseous implants, dental implants were in the form of subperiosteal implants, where the artificial teeth are attached to the exposed jawbones using screws. Another form was blade endosseous implants wherein there is a flat metal piece resembling a blade that is placed within the jaw bones. The use of dental implants was traced back to the Maya civilization over a thousand years ago. Dental implants was observed in a Maya burial site involving a woman in her twenties ho had three tooth-shaped shell pieces placed on the missing lower incisor teeth. These dental implants were thought that they were placed after the death of the person, but one archeologist has found that it was placed when the person was still alive because the shells were surrounded by compact bones. A typical dental implant consists of titanium screw that resembles the root of the tooth either with a smooth or roughened surface. The titanium used in dental implants may be of different grades (Grade 1 to 4) depending on the amount of iron and carbon components. Grade 5 titanium contains 4% Vanadium alloy and 6% Aluminum. 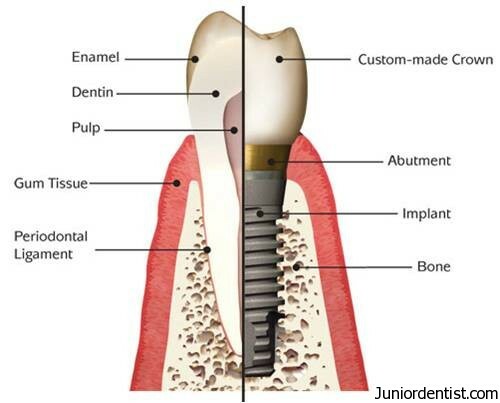 It is also used as a dental implant and has similar osseointegration factors like the pure titanium used. It also has better fracture resistance and tensile strength than other forms of titanium alloys. However, most dental implants today still use the pure titanium from grade 1 to 4. The osseointegration characteristic of dental implants are improved using sandblasting, etching, anodizing, or by plasma spraying. These also increase the surface area of the dental implants to improve the attachment of the dental implant. The main advantage of dental implant is to have a solid and good support for the new teeth because the bones heal completely and tightly on the new implant. The dental implant may require months of healing because the osseointegration process may take some time. I think having implants is the best way to replace those broken and damage teeth. But I was thinking how much will it cost for a dental implants?